The Body Blueprint begins with the Functional Movement Screen (FMS). A nationally recognized screening tool utilized by many fitness professionals and sports organizations, including the NFL. Its primary purpose is to assess any imbalances or asymmetries in your body. Your movement patterns, stability and mobility will also be assessed. The program design department then utilizes the data from the FMS to design the most effective and safe exercise programs for you. If needed, your specific corrective exercise protocol will also be designed. The second portion of the Body Blueprint is the Integrated Kinetic Chain Assessment. This assessment is also widely used by many fitness professionals, particularly athletic trainers. The Integrated Kinetic Chain Assessment consists of two parts. The first part is a postural analysis; we will take six photos of you standing in a neutral position in front of a grid. This is done to analyze your posture. From these photos, we can then determine if there are any underlying issues you may have while static and non-mobile. The next step is to take pictures of you in a squat pattern, also in front of the grid. These are also analyzed and used to determine any underlying issues in your major joints, limbs, ankle, scapula or head/neck while you are mobile. So, what does all this mean for you, the member? The best way to answer that is to ask you a series of questions. Is it important to you to see results from your workouts? Do you want to get to your fitness goals quickly and effectively? Is safety important to you? Would you like to decrease your risk of injury, both inside and outside the gym? Move better and experience less pain? Would you like an exercise program designed specifically for your body and its particular needs? Would you like your personal exercise program to be designed with sustainability and longevity in mind, meaning it’s going to take care of your body so that you’ll still be exercising with the same vigor in 10, 20, 30 years? Do you want to both feel and look great? If you answered YES to any or all of these questions, then you understand the value of the Body Blueprint. We are all about safe and effective exercise programs at Evolution Fitness. The Body Blueprint is one of the many tools we use to do so! Put simply, the Functional Movement Screen (FMS) is a screening tool that we utilize to assess any imbalances or asymmetries in our your body and movement patterns. It is a nationally recognized tool utilized by many fitness professionals and organizations including the NFL. 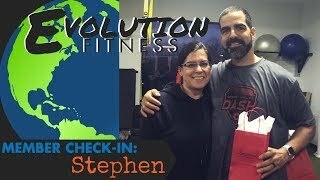 We were visited by Ashley Johnson of Eye Opener on PHL17 and Evolution Fitness shows her how FMS works. How does the FMS work? During the FMS, you will be taken through a series of natural movement patterns that are key to normal function. The trained fitness professional leading you through the FMS will document any compensations, asymmetries, or pain you may experience while performing the movement. These compensations and asymmetries will not only limit the effectiveness of any physical conditioning and functional training, but they can also lead to injury if not properly addressed. Once the fitness coach has determined where your particular imbalances lie, he/she can then accurately implement the proper corrective exercises to fix and re-balance any compensated movement patterns. The FMS also informs us which exercises to leave out of your program until the compensated movement patterns have been corrected so as not to risk injury. Is the FMS a fitness test? No, the FMS is NOT a test of one’s physical ability. There are many outstanding athletes who, because of previous injury or overuse, score low on the FMS. The FMS is not a test at all. It is a screening tool, a way of assessing where you are at and how far you have come. The great part of the FMS is the ability to improve on your score through the corrective exercises. We recommend to all of our members that they get screened at least once, if not twice, a year to track their progress. The Functional Movement Screen is an invaluable tool for many reasons. It helps us to categorize the efficiency of these natural human movements, including symmetry, balance, stability and mobility, while also enabling us to identify compensation patterns developed from disuse, injury or overuse. Beyond that, it helps us identify underlying injuries or possible risks of injury and it informs us which exercises are appropriate and safe for each of our members. It helps our members achieve their fitness goals faster, quicker, better because they perform movements with better form and efficiency.